Onn Kee Tauge Ayam @ Ipoh – Mission Completed! “Kon Lou Sar Hor Fun” (dry kuey teow, or flat rice noodles tossed in a savoury mix of soy sauce, dark soy sauce, dash of sesame oil and shallot oil perhaps) is essentially the soup-less counterpart to the otherwise perfect companion to your serving of bean sprouts chicken. Surprisingly, yes. And it has been THAT long since my last visit to the famous ‘nga choy gai’ outlet in town. Back then, they did not even open for lunch. Only dinner-supper, and damn packed like sardines almost every single night. It’s slightly better now, but still come on weekends/public holidays and I bet you’d scurry away like roaches on a hot plate. Or something. So please, you can say your prayers now if you’ve waited with bated breath for this (or not) . 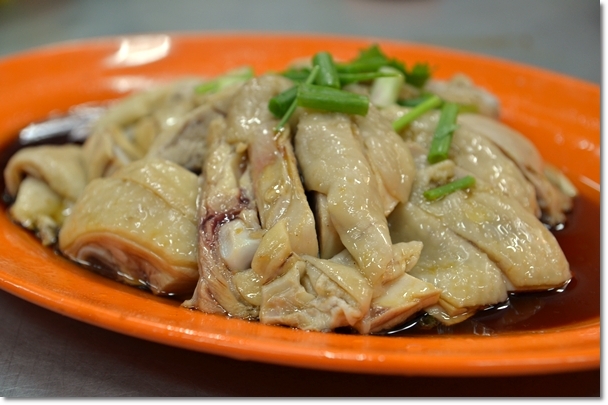 And enjoy what could possibly be my LAST post ….. on tauge ayam in Ipoh, that is. 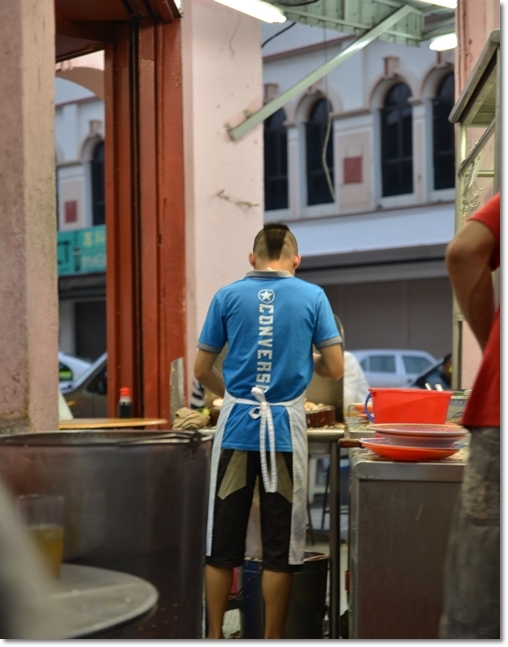 The Young Mohawk Sifu chopping relentless on the hundreds of poached chicken every night! I feel complete now. Like as if I have run a full circle and come to this concluding saga. 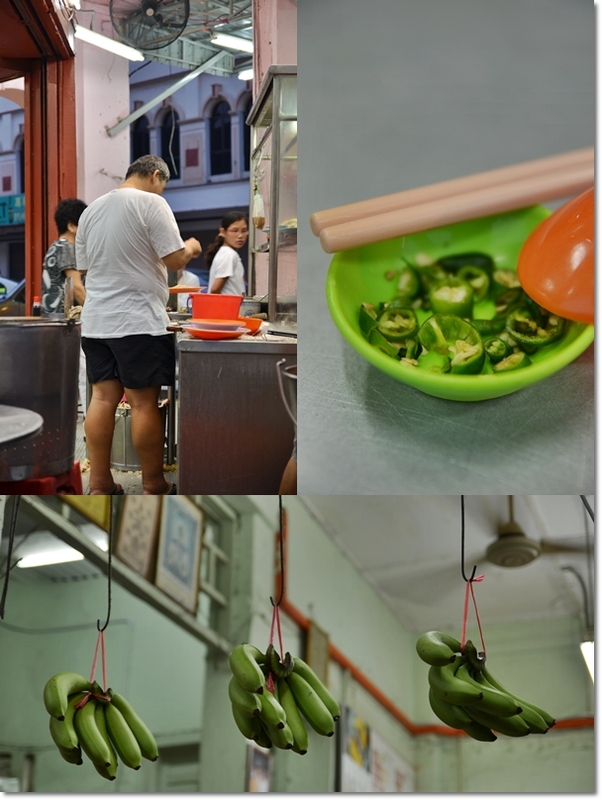 A curtain call … for the chapters on this symbolic dish of Ipoh. 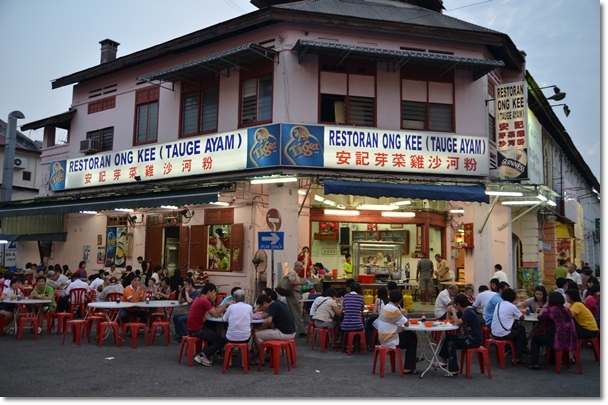 There was this urge to visit Onn Kee during my long tenure as an active food blogger in Ipoh. But to no avail, since going all the way to town after work and jostle with the crowd (mostly tourists though) for a meal of bean sprouts chicken? Nah …. just not that alluring. Then fate took things into his own hand. I changed job and moved away from my beloved hometown of Ipoh. And the hankering started. If you have followed the posts on Ipoh food since December 2010, you must have felt my undying passion for good old hawker food in Ipoh. If this looks bland and unattractive to you, don’t turn away just yet. Sip on the flavoursome stock laden with the sweet essence of the chicken, a light dash of pepper for that robust tinge, and on top of that … the incomparable Ipoh famous kuey teow. 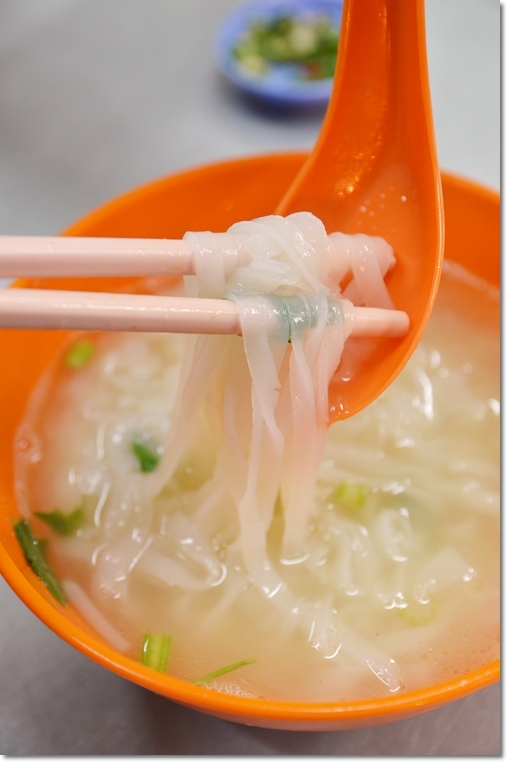 Translucent, smooth and without the usual unpleasant processed rice noodles taste. Every trip back home was a delight. The planning got more and more meticulous, to the extent that a two days trip could have packed 6 or more places into the itinerary. How we human beings never appreciate things when we have them, but instead pine for the long lost love after the opportunity’s gone? Plate of crunchy bean sprouts (hence the “Tauge” portion) from Ipoh; grown from the magical (I was always tempted to say that) limestone hill water …. Now let’s get back on track. Onn Kee has been around for as long as I could remember. Or started teething. Lou Wong being the designated champion of “Nga Choy Gai” in Ipoh (from a media point of view), Onn Kee is ironically situated diagonally across. And a second outlet adjacent to Lou Wong. Talk about stiff and unfazed competition. There are those who stood by Lou Wong, but then there are countless others who have sworn by Onn Kee. Like how you can never please both the red and yellow shirts in our neighbouring country up north, and to a very recent extent, in our backyard as well. Plate of half a poached chicken for four person. Don’t be a smart alec and ask for roasted chicken. Bean sprouts chicken combination in Ipoh is never meant to include roasted, or soy sauce, or worse … curry chicken, okay? Comparing Lou Wong and Onn Kee head to head, I cannot take sides. Reason? No, seriously ….. Lou Wong had this inconsistency issue whereby on good days you get very smooth, tender and firm poached chicken and they do their blanched bean sprouts with red chillies so well. But I have had a bloody, medium rare (?!) chicken on one of their ‘off’ days …. and was petrified. Onn Kee did not excel in any of the specific components (bean sprouts, chicken or even the kuey teow) but managed to keep the customer’s expectations in check. Just that they lack the human touch …. don’t bother waving relentlessly for them to take orders. They will come to you in their leisurely stride. At least that was our experience that evening, and though the lady was not being entirely hostile … she chose to stand around and attended to the other tables before walking to us. And we were seated directly beside the stall where they’re operating. A plate of spare parts. Or offal/innards, if you would like to be grammatically correct. The meat balls come from the same supplier, I was told. I knew because back then, Mum used to buy huge packets of them to be boiled in soup back home. And the supplier told her that they supply to most ‘nga choy gai’ outlets in town. The chicken though was cooked thoroughly, the meatier portion (chicken breast) was too tough and rubbery, not as silken smooth. Oh well … guess you can’t have the best of both worlds then? 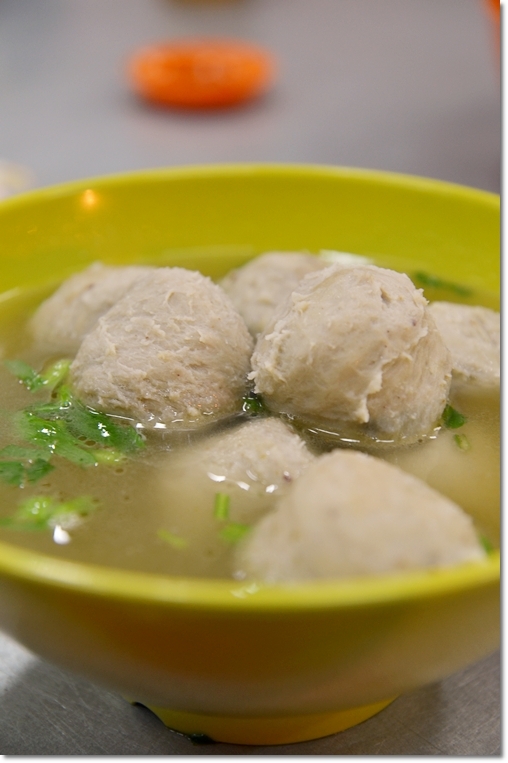 Meat Balls in soup; in case you’re not fond of chicken and fish is definitely out of the question here. It came to about RM10-11 (about USD3-4) per person inclusive of drinks. Not exactly cheap for street food in Ipoh, but then again… this IS one of the most famous Ipoh tauge ayam we are talking about. Not some roadside wannabes. Still slightly cheaper than Lou Wong or Cowan Street, yet my allegiance still lies with Cowan Street. Wondering why there were bananas hanging by the window? Beats me. Not as crazily-packed as before, and this was on a Sunday evening. Thank you. I bow in admiration of your patience, and you can heave a sigh of relief now. I know there are several other stalls in Ipoh; the ‘crouching tiger/hidden dragon’ of sorts tucked in residential areas and neighbourhood I am not familiar with, yet if you have a better recommendation than what is on THIS LIST, feel free to drop me a comment or mail. *Refer to the post on Lou Wong for the exact directions and Google Map. Onn Kee is diagonally opposite of Lou Wong’s. 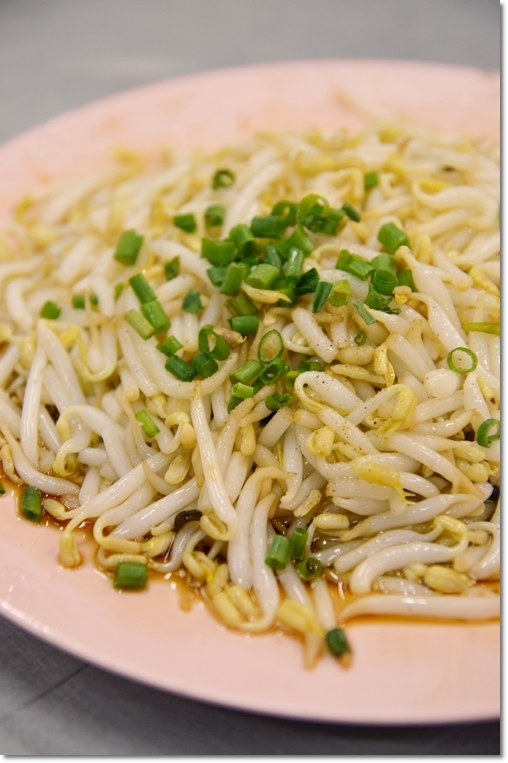 Ipoh crunchy bean sprouts is the best! thanks for the post..will have to try this place soon! recently i went to lou wong..hmm i’ve something against their chicken as well! Why TallGal only and not with Motormouth ….. you seem to forget your roots FCOE …. True. Like how you won’t treasure something until it’s gone. You mean of Onn Kee or of tauge ayam in general eh? The kuey teow soup sounded so delicious! 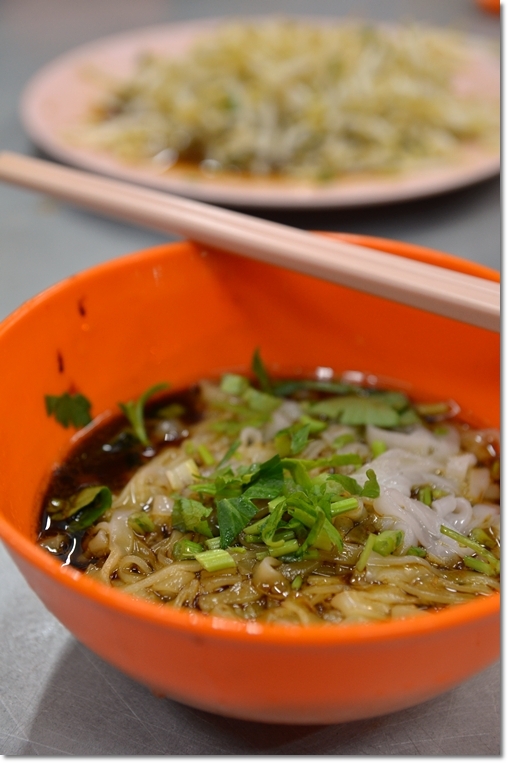 I really want to go to Ipoh just to have a makan trip! Would be able to get a lot of useful information from your blog! Hi Wen Ching. Did that already. Sorry took me some time to link you guys up. Thanks Su Sian. KL’s more than enough for me to cover, though searching for the really good ones tucked in corners of town … this might take some time. Beautiful and yummy! I would love to try this! I dont understand this post. I must not be getting something basic here.